At Condray & Young we offer many different packages based on your individual needs. These packages ensure your sprinkler system will run at full optimization. For more information on packages and sprinkler repair service please call or request more information by using the “Request a Free Estimate” tool above. Our company is more than qualified to design and build efficient water dispersal systems. We hold the City of Topeka Master Irrigation Installer certification and the Certified Backflow Technicians certifications, both being your personal guarantee of our professional approach to things. There are certain steps we follow when delivering a new irrigation system. This is what happens when you order a new sprinkler system for your yard. Step 1: we talk to the customer about his needs regarding irrigation It’s important for us to know more about the purpose of the irrigation system. For example, commercial sprinkler systems are very different from residential ones. Step 2: off to the drawing board. After we get an idea about your needs, our designers start working on your project. Based on your yard measurements, we will design an irrigation system that can deliver the optimal quantity of water. Step 3: delivery and installation. Once we finish designing your new irrigation system, our team will deliver it and start installing it. Don’t worry about the mess; we’ll always clean up after the job is done. Step 4: sprinkler system maintenance. After a while, we will stop by to see if everything is alright with your irrigation system. The system may be new, but it will need a couple of tweaks now and then. Watering is an essential part of your lawn and landscape maintenance even during winter. Why waste hours with hose-watering and why never knowing for sure how many inches of water to deliver to your turf, flowers or trees? Installing a smart irrigation system saves you time, money and resources in the long run. 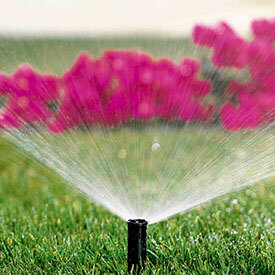 Ask now for a free estimate and let our team come up with the best landscape irrigation solutions for your property!